Wow your friends and family when you show off your handmade paper and one-of-a-kind books that you created at Seastone Kids! This is the summer destination on the island to inspire and ignite your imagination. Kids, you will explore and create unique handmade paper and books to treasure. Dip a mould into a colorful vat of pulp and pull sheets of paper. Experiment with various art techniques such as stamping, painting, sewing, beading, and collage to embellish your extra special books. A perfect way to remember your summer vacation! Can be scheduled for groups of 3-6 children. Contact Larissa for more information at (508) 693-5786 or l_bernat@yahoo.com. 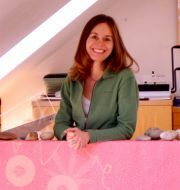 Larissa Bernat is a first grade teacher at the Oak Bluffs School on Martha's Vineyard. She has taught bookmaking and papermaking to children for the past eleven years at Seastone Kids. Her experience includes teaching bookmaking classes in the Belmont school district and at Featherstone Center for the Arts.